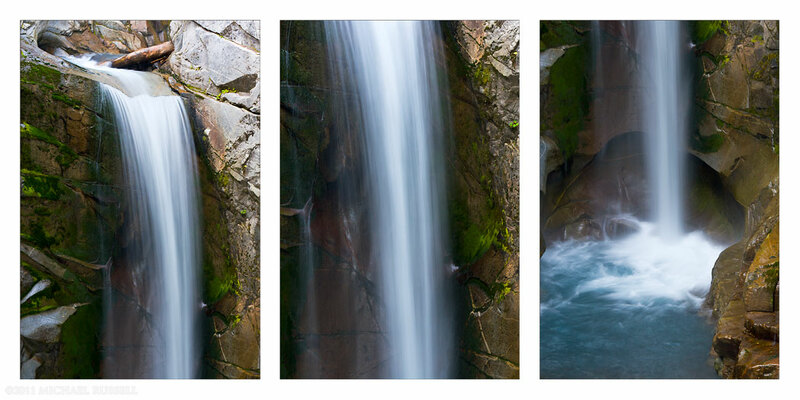 When I originally made this series of photographs of Christine Falls in Mount Rainier National Park I had intended to stitch them into a vertical panorama (vertorama). Displaying regular, horizontal panoramas is tough – the vertical variety is even more difficult. Upon actually stitching these together the results were a bit lacking, and displaying them individually seemed out of context without the other two. So I’ve tried making them into the triptych you see above. I haven’t done this before, but I think it works well with these 3 images. Do you think I was successful with this attempt? Do you ever shoot images specifically for this sort of presentation? Thanks Marc! I agree that this sort of presentation may be a bit more interactive than a straight up waterfall shot or a vertical panorama would have been. WoW, this is a really nice composition of flowing water! I’d love to get that as a poster/wallpaper for my room! A brilliant set of examples for slow shutter speed photography. Good work.